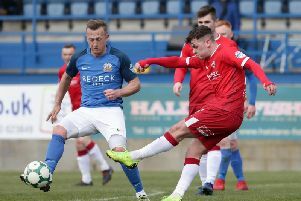 Oran Kearney was delighted his depleted Coleraine squad produced a terrific display to see off Warrenpoint Town in Saturday's Danske Bank Premiership opener at The Showgrounds. Speaking after the game Kearney praised the attitude and application of his players, including the club's Academy graduates making their debut for the the Bannsiders. Alexander Gawne and Ben Moore started the game with Andrew Whiteside and Caiolan Brennan coming off the bench in the second half. As for the Point, boss Stephen McDonnell was left disappointed with the goals his side conceded on the day.